The characters and people that inspire me have figured out parts of themselves. Whether conscious or subconscious, they know what they like, dislike, their ambitions, and how much they can realistically accomplish. Watching action heroes mow down everything in their path doesn’t inspire me because there’s no dramatic tension and release. They aren’t believable without a cool-down release period! In “The Story,” after working toward their ambitions, how do Trishna (left) and John (right) unwind? Set in a version 90% the same as our late 1990s, the Internet is still an efficient way for people to connect based on hobby rather than location. Trishna isn’t popular at school and doesn’t go out much. John is bounced between homes so he can’t keep any friends even if he can stick around long enough. They both enjoy free computer games and joined the same popular message board. Trishna gravitates toward John through some message board posts he writes, and they chat on the “Messe” instant messenger program. They end up spending most of their high school downtime chatting on Messe. That is, between school and homework. Trishna is on-track to getting into a good college, which upon graduation, will help her establish a good life. John doesn’t have much of a future anywhere he finds himself throughout high school, but he’s just sharp enough to keep up in school, so they become study buddies. It’s mostly so they can help each other with their homework, although it’s a sly way for Trishna to justify to her parents why she’s chatting with “a boy three hours away” every day. They keep that discipline up after meeting and going to that college. After they’re done with their homework or studies for their tests, they’ll spend most of their remaining free time unwinding, chatting about observations in life, and having fun. Trishna grew up watching animation like Studio Ghibli or Disney, but re-interpreted for copyright/creativity purposes, featuring cute characters doing cute things that she shows John. John enjoys these, and they find videogames they can enjoy together, both new and exciting, as well as more narrative-driven games. They’ll also try out more outgoing hobbies together as well. Among the biggest “tries” will be floating. 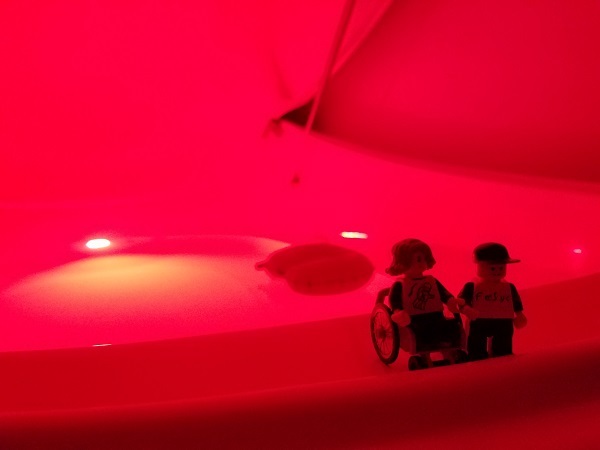 Float tanks are only just becoming popular, so though anachronistic, it’ll fit within their particular college environment. Hearing about a local float tank center through word-of-mouth, after chatting about accommodations, Trishna will dive in first. John will wait outside of the tank to help her in and out, studying in the meantime, and they’ll switch after the water filtration cycle. If this becomes a bigger plot element, they may become float tank spokespeople. If not, it’s just brainstorming. Trishna and John may not have the most exciting adventures during this period of their lives. That could change after college. The main intent during this part is their self-discovery and world discovery. Including how they unwind from stress. Sources: Some of the stress moderation techniques I use. Inspirations: None, other than my own experiences with float tanks. Related: My Float Tank essays. [Fiction Practice] Your Barnyard Animal?